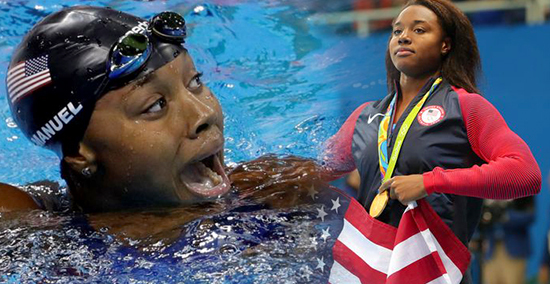 Simone Manuel's gold medal in freestyle swimming was an unprecedented win for African Americans. But like other victories in sports, it hardly changes the biased coverage they encounter in US media and the racism they face at home. Manuel sounded off on this issue in the media. MILWAUKEE, Wisconsin, USA — While the Rio Olympics take place in Rio de Janeiro, Brazil, thousands of miles away US police in Milwaukee, Wisconsin gunned down yet another young African American man. The two worlds African Americans experience — the one in Brazil where they are heralded as heroes and sensations and the one in the US where they are pegged as villains and criminals — are literally and figuratively worlds apart. The comment made waves in US conservative circles where opponents ranted: How dare she bring up police brutality? How dare she embarrass the US nation on a global stage? The irony of their anger is lost only upon them. Throughout the Rio Olympics, the US media has incessantly ridiculed other nations for their shortcomings, local tensions, and sometimes profound tragedies. US media discussion of other countries during the opening ceremonies was a conglomeration of terrorism abroad, war-torn nations, and refugees who do not have a home. The only celebratory remarks came when the media commentators discussed their own shores, describing an exceptional nation that has a melting pot of success stories and is a model for other countries to follow. Only that’s far from the truth. There is much domestic terrorism, local tension between racial groups, and tragedies of fatal shootings of African Americans that occur in the US. Simone’s timely comment during her interview dismantles the fiction of a harmonious US and brings attention to such problems. While the country might want to paint a rosy picture of itself before the world, its closet needs to be cleaned out. Racism is part of the filth that needs to be discarded. Along with racism, the pervasiveness of whiteness is suffocating. The US media coverage of the Olympics is evidence of this smothering. During the first week, the US media only raved about white swimmer Michael Phelps, who has been suspected of doping and even admitted that “I can honestly say in my whole career I don’t know if I have ever competed in a clean sport.” (Of course, this issue conveniently that never came up during the media coverage). At times, the cameras under their white gaze would rather focus on white Canadians or Germans rather than African Americans–you know, the US citizens. After a week of almost complete and utter whiteness with swimming, track and field started, but the narratives of whiteness persisted. The US media cameras followed white athletes persistently and those who were half-white got the next best treatment. The women’s 400-meter hurdle coverage focused exclusively on a mixed race girl, a rising high school senior whose mother was white and father was black. Indeed she was only the third best US runner in the event and didn’t even make the finals. Virtually left out of this coverage were two African American women: Ashley Spencer and Delilah Muhammad. The US media didn’t bother to show either woman’s semi-final heat in its entirety, only a fraction of the end, although they each won and advanced to the finals. Muhammad even had the fastest time overall of all the qualifiers and is a favorite to win the race. African Americans are usually the subject of US media coverage if producers can weave together a story about tragedy or deviance. Silver medalist in the men’s 100-meters, Justin Gatlin was featured having served two doping convictions—the first, because of a banned substance in his ADHD medicine and the second, he alleged, because a masseuse vindictively used a steroid cream during his treatment. African narratives in US media are just as paternalistic. When American cameras visited David Rudisha, the men’s 800-meter world record holder and gold medal winner from Kenya, their story focused on Rudisha forming a Kenyan Olympics in his community. His aim? To stop the tradition of killing a lion as a rite of passage for manhood. The underlying message here was that Kenyans are barbaric and this man, Rudisha, who has seen the world through his travels as an athlete, can help reform his village; in adopting the ways of foreigners, they will become a better community. The media also used the Olympics to prop up American race relations beyond the grim day-to-day realities. The story surrounding sprinter Allyson Felix was framed in favor of espousing racial progress. Allyson spoke of her grandmother. The US media inserted images from the segregated pre-Civil Rights era. Allyson discussed her making it this far in the Rio Olympics. The US media implied the country had made it far through racial progress. The presence of African American athletes representing the US in the Rio Olympics symbolizes something different for African Americans than for the media. The athletes themselves recognize their own perseverance and dedication, the support from their families and communities. The media emphasizes a national embrace of African Americans on the country’s team, but subtly in the portrayals of African Americans, the white gaze distances itself from that embrace. Back on US shores, the reception of African American athletes by white Americans on social media was full of criticism and scrutiny. Gabby Douglas, who won the gymnastics all-around championship in the London 2012 Games and the team gymnastics championships in the Rio Olympics, was ridiculed by white Americans for her hair, her demeanor, and for not putting her hand over her heart during the playing of the national anthem. In comparison, during a previous Olympics, Michael Phelps burst out into laughter during the playing of the US national anthem but received no backlash from media or fans. Underlying the scrutiny Gabby received was the envy and jealousy that a black woman, the first to accomplish the feat of an all-around victory on that scale, was back on the US team a second time. The necessity of her participation on the US team is a blow to whiteness and the ideology of white superiority. Not to mention, two black women, Gabby and Simone Biles—this year’s gymnastics all-around champion—was probably more than many whites in America could stomach. As countless sports show, US prowess during the Rio Olympics and in general, from fighting world wars to performing popular culture, is deeply indebted to African American aid. Without African Americans, there would be no Industrial Revolution, no cash crops, no historic buildings with finely embedded Adrinkra symbols, and no extensive highways. The African American influence is profound in making the US what it is today. It is an indefatigable force driving the medal counts. It is only fair that the contributions and value of African Americans is validated beyond the Rio Olympics. Simone Manuel’s comments brought this realization into its proper perspective. African Americans should not headline the US team only to face a burden of blackness in America when they arrive back home. Afiya X offers us a stimulating view through her astute lens in film criticism of US media coverage of the ongoing Olympics. A nightmarish irony where on one hand African American athletes are praised as heroes of the US Empire, and on the other hand where they are painted as just products – although fine products – of a backward water of tragedy and social deviance. This framing is captured well within the careful rendition that is the Olympics, where the mise-en-scène of white supremacy is ever pervasive, no matter how dominating Black athletes are in the most exciting corners of the games. This is a humbling read. Enjoy. I have never been surprised at these developments but this is God’s own country or? I have always maintained this , the blackman has to work twice, think twice ,outwork his or her peers to be really accepted and stay mentally strong ,you just have to know who you are and believe in your self. “God’s country” indeed! The “Shining City upon the Hill,” indeed. That is the stark irony I guess. Only those who listen or are entertained by propaganda eat that diet of disinformation. “As countless sports show, US prowess during the Rio Olympics and in general, from fighting world wars to performing popular culture, is deeply indebted to African American aid. Without African Americans, there would be no Industrial Revolution, no cash crops, no historic buildings with finely embedded Adrinkra symbols, and no extensive highways. The African American influence is profound in making the US what it is today. It is an indefatigable force driving the medal counts. Once the African eliminate the god god mentality, they are half way there. The paradox and tale of racism and blackness. Although a lot has been done to eliminate racism and blackness , a strong awareness needs to be created and such media houses needs to be called out ,it takes time for institutions to change their patterns. Let me offer a correction my dear friend Kobby Asamoah. I do not think Blackness has contributed any problem to racism. Whiteness on the other hand is at the root of racism. So if anything needs eliminating, it is racism and whiteness. Also, the institution itself is the root perpetrator of racism. There’s no racism without the institution. Often the mistake is made that people have changed but the institutions are yet to. I do not wholly disagree with this view however I offer a more profound perspective. And this is not just my idea, I have also borrowed it. The institutions are the arms of RACISM. There’s no racism without the racist institution. Americans, white Americans, are capable of average humanity, they can if the truth is told to them, love their neighbors as themselves. They can love Blacks as much as they love whites. Only the institutions – the media, the government, the law, the police, etc. – are opposed to this. They are interested only in perpetrating racism because to entrenches power withing a narrow slice of population. There’s not police brutality if Police departments are fair in the same way that lynching in the US would have been halted had the racists government of old stopped and prosecuted people. If the US DOJ and the US FBI are fair police brutality will stop yesterday. There’s no mass incarceration if the US judicial system is fair. These institutions are not fair because, they are modern versions of the Plantation. So although Blacks may have left the plantation to meet up with their fellow whites, the plantation and their owners never left America. They became an integral part of US government. More, they became the US government. Racism lies nowhere squarely but at the heart of US government and its institutions. Audu Salisu that’s what we term the establishment status quo which seeks to promote and fan the embers of racism through this conduits, overall there is has to be a robust awareness ,more blacks getting into business and owning some of this media houses like oprah did with “O” ,even at the corporate level and institutions whitness prevails . Kobby Asamoah I’m that exactly that… It comes down to patronage, how much you give to them at the end of the day while they trivialize your contribution. Ive advocated for an African news outlet that will claim objectivity and objectiveness yet send every message from African point of view for a long time. We’ve all witnessed how within a matter of one decade, Al Jazeera became Arab mouthpiece and recently RT has freed Russia from Western propaganda. One of my dreams was to write a proposal for this and present to Ghadafi when I was a student. I did not master the courage to do so until he was butchered. Overall we’ve seen some upward trend with blacks now striving to control the narratives ,my guess is this will continue as more and more people seeks the truth behind every propaganda laced media outlets. Well, Audu Salisu, you don’t need money and institutions. Sometimes you only need cultural workers like yourself and the friends of yours at Grandmother Africa. People can make a change. I prefer that the cultural workers like yourself that Ayi Kwei Armah talks about, and at Grandmother do the grass roots work. You never know who’s reading. One rish mofo might one day read you and launch a huge African news! Sometimes all it take is a persistent cultural work. Keep doing what you and Grandmother are doing. Do more. Become monks at it. You don’t need anyone’s money. The moment it’s about money, it ceases to be cultural work. Thanks Solomon Azumah-Gomez, We are slowly freeing our resources and our minds. But we need an information machinery to push it. This is why I take Grandmother Africa seriously…. I think it has the potential to be that. I believe if people like you, Audu, can get their hands on board and contribute themselves to Grandmother, the people’s mouthpiece, true change will appear on the horizon. We Africans must learn the value in cultural work. As for building institutions, we the people can build our own institutions so long us we don’t expect that institution to rewards us. We can build institutions without money. If we can look at institution building in Ghana or in Africa in general as Communal Labor, Ghana will be a better place longest. Solomon Azumah-Gomez and Audu Salisu, you guys a wonderful. The framing that Grandmother Africa is the people’s mouthpiece is refreshing. The framing that it is Communal Labor of Cultural Work is also eye-opening for me. At this point I will take a lead and re-examine the framing at grandmother to share with all, for consideration and input. Thanks guys! One of the cultural work is the trust issue which is one of the social capital in nation building and every institution ,currently we are just deficient in that aspect , our society is gradually losing that in preference for individualism. Institutions can reward us in ways that are not defined by money and material gain. The rewards can take the form of communal support, community building, knowledge production, youth development, cultural enrichment, improvements in literacy, and so on. Too often, when we think of institution building, it is with the framework that we could become millionaires because of it. I don’t know when this outlook developed, but it is in total opposition to building anything truly meaningful to a society. Through grassroots cultural work is the best way to build any useful institution that would be resistant to corruption.